New York, N.Y.—The U.S. Consumer Product Safety Commission (CPSC) and Crosman Corporation has voluntarily recalled air pistols after discovering an explosion hazard. The CPSC announced the nationwide product recall on September 6, 2013. The Crosman air pistols were recalled after discovering that they can explode at high temperatures, which can eject the pistol’s broken plastic pieces into the air and into someone’s eye, as well as cause other injuries to consumers. “This recall involves Crosman semi-automatic style air pistols with model numbers C21, C31 and 9-C31BRM with serial numbers beginning with 12J, 12K, 12L, 12M, 13A, 13B or 13C. 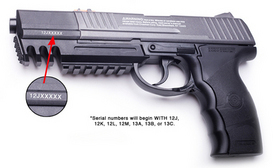 The model and serial numbers are located on side of the air pistol. The air pistols use a CO2 cartridge to propel plastic BBs and are used for recreational shooting. The air pistols are black, measure 8 ½ inches long and weigh 1 ½ lbs. Crosman’s name and partial address are printed in the ‘Warning’ information on the left side of each pistol,” the CPSC reported. Consumers are advised to return their air pistols to Crosman fro a free replacement air gun or a full refund. For more information about the air pistol recall, consumers can contact Crosman Corp. toll-free at (866) 583-7340 anytime, or online at www.crosman.com. Legal News Reporter: Nicole Howley-Legal news for New York product liability lawyers.